Inuit-Yupik Northern Caribou skin, beads, caribou fore teeth, female inner parka, 1930’s Two of many things I love about leather: 1. it is an organic material—it came with unique natural look and reacts to its environment and its users and changes over time, and 2. leather craft can date back to the beginning of human history. I will explore its organic characters by hands on making experience, and this post is devoted to its tradition. Leather Craft, Leather Work, either amateur or professional is an ancient craft which to some extent still uses the basic tools that were in use many centuries ago. In fact it is one of the oldest crafts known to mankind. One of the artifacts found in early settlements of primitive man are bone needles. At that period the human race were ‘Hunter Gatherers’ Thread & cloth were not in use at that period of our history. 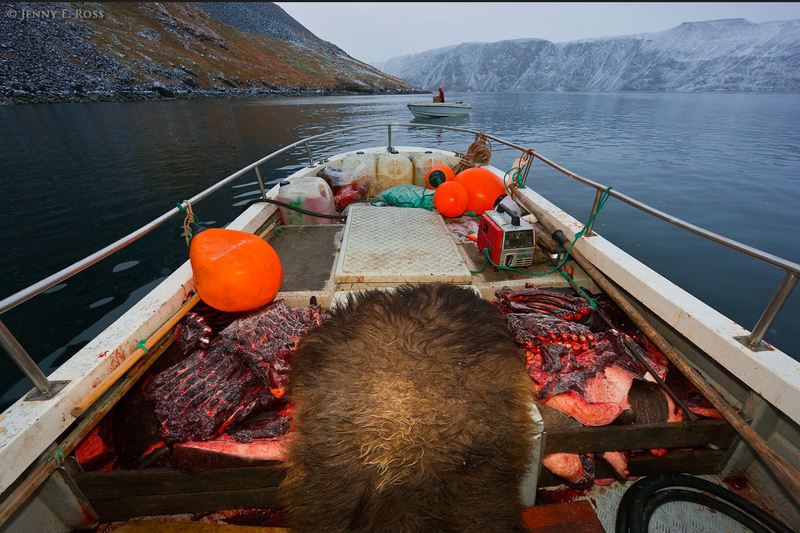 Protection from the elements was derived from the animals killed for food, the skins were made into clothing. As there was no thread the obvious choice of material to use with the bone needles was gut. Cat Gut to be more accurate, it’s source the stomach sinews (mostly sheep). 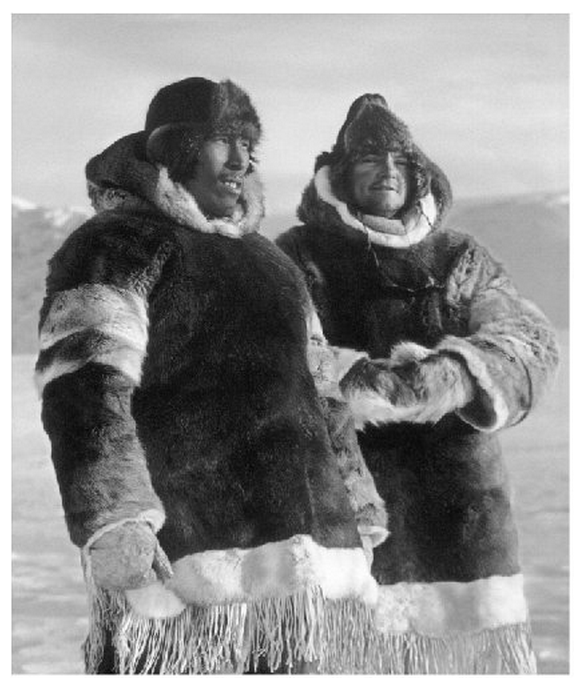 When we encountered the first Eskimo tribes and the North American Indians they were in effect Late Stone Age people and were producing highly developed clothing using leather and sewing with bone needles. 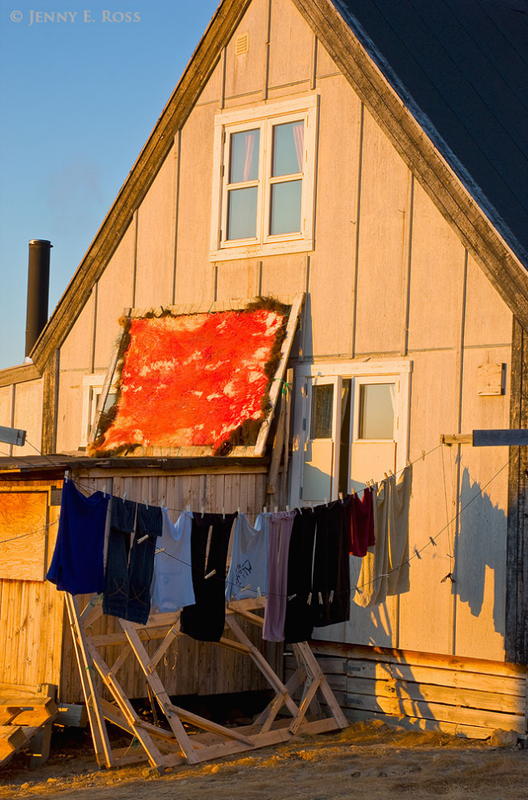 For the Inuit, warm clothing was a must in the extremely cold temperatures of the Arctic. Since caribou fur was considered the warmest, it was used to make their layered parkas for the winter. 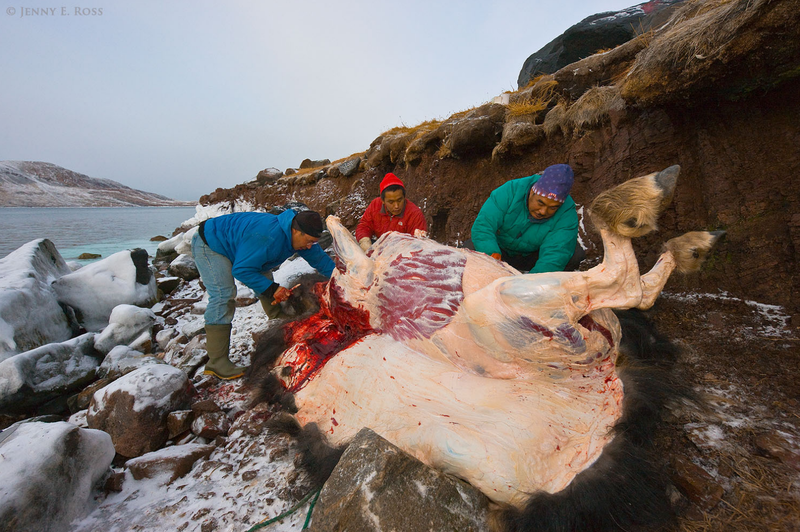 Some groups also made coats from polar bear fur. 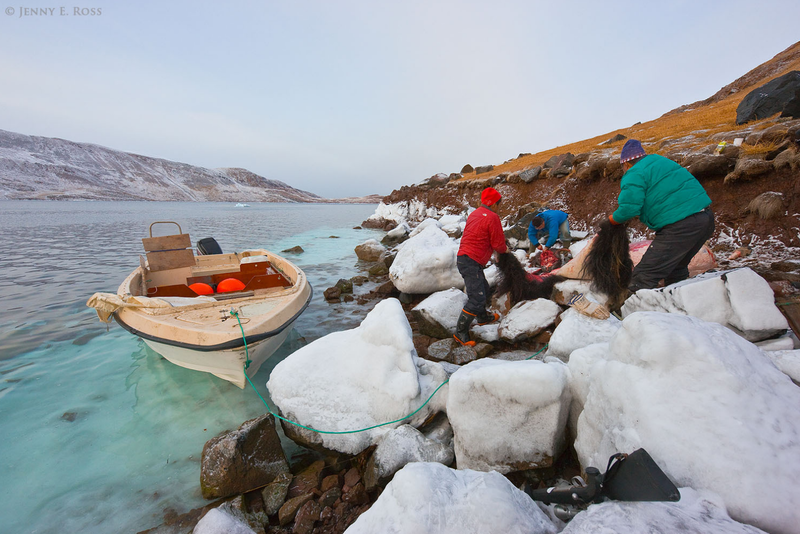 Seal skin was used to make waterproof boots, as well as lighter parkas for spring, summer and fall. 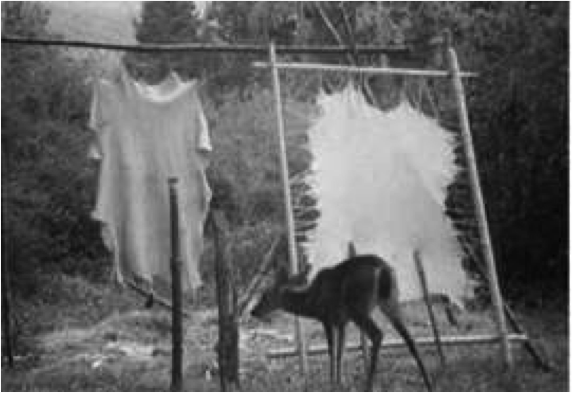 the Eastern Woodlands, Algonquian tribes used deerskin for clothing. Men and children wore leather robes in the winter. Moccasins made with buffalo hide were worn by everyone. The Plains tribes used buffalo hides to make warm robes and moccasins, but they preferred to use the soft skin of elk and antelope to make most of their clothing. Traditional Apache all learned how to skin leather and sew stitches. Among the Hopi, unlike in many other tribes, the arts of weaving and leatherwork were not confined to women, but were done by men as well. This tool is called Ulu, used to scrape the fat and stuff off a hide. Buckskin was made and used by all of the culture areas of Native North America, from the fishermen of the rainy northwest coast and the caribou hunters of the tundra, to the farmers of the southwest and eastern woodlands. 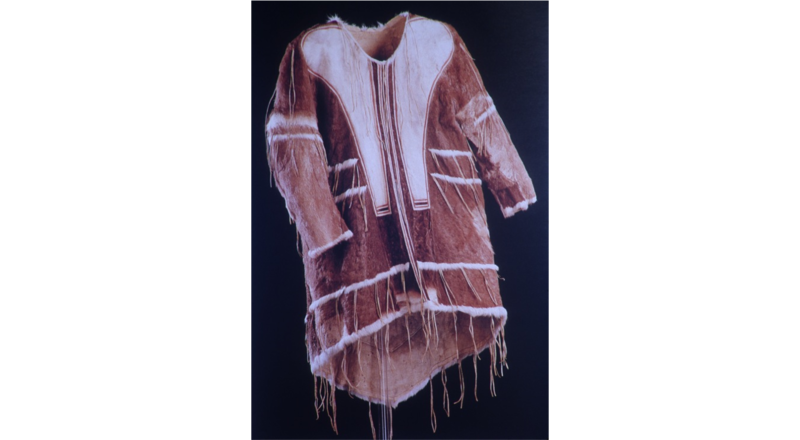 Deerskins were the most commonly tanned, worn and utilized skin because of their durability, softness and availability. They were the basic “fabric” of pre-historic times. 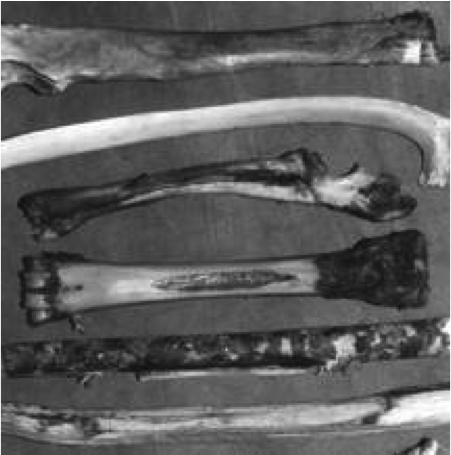 Other animal skins were also tanned using variations of the brain tanning process, (buffalo, moose, elk, antelope, caribou, bighorn sheep). Even furs were tanned using brains and woodsmoke, though they were handled differently to prevent the hair from slipping out. This Shawnee man was sketched in 1826 by Tardieu L’aine. Notice that his buckskin clothing isn’t fringed. Buckskin was used and worn in many styles besides the stereotypical fringed leggings and loincloth. Most of what we know about traditional brain tanning methods comes from the American Indians. There is an extensive record of their tanning processes, written down by anthropologists, explorers and Indians. 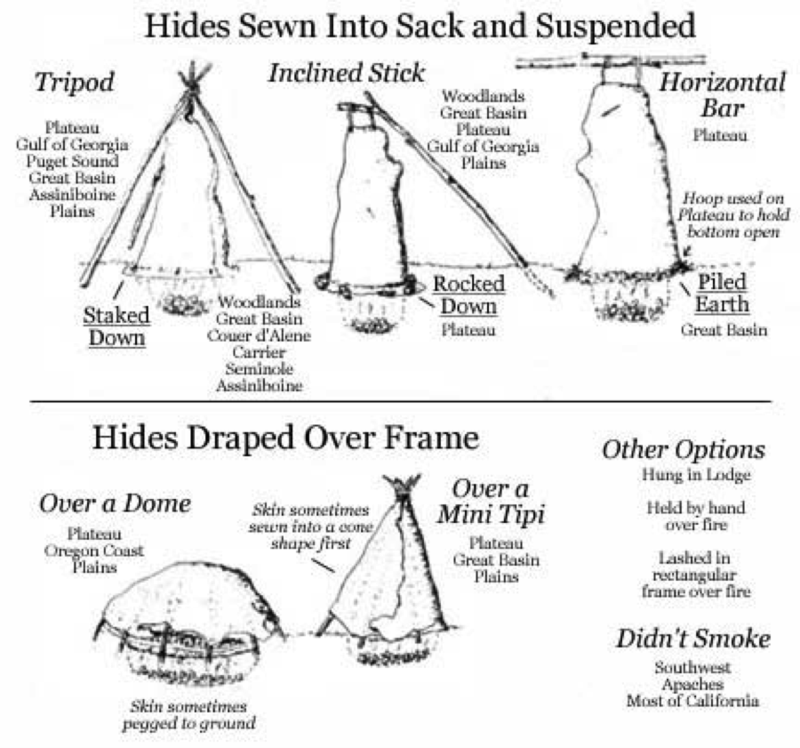 These deerskin dressing methods will be broken down into subjects in the order of their most common application: beams, fleshing, graining, structure openers, brain solutions, softening, smoking and dyeing. Clark Wissler, Plains Indians anthropologist, 1910. EDGE SCRAPERS– nearly universal, used for fleshing and graining. Top to Bottom: Rib, Buffalo (also Deer, Elk, Mtn. Sheep, Moose). This one is actually an extension of a vertebrae from upper rib-cage. Very flat, stout tool, with natural edge. Rib, Buffalo. Ulna-radius, Deer. Natural edge. Don’t over clean, as sinewy membranes hold it together. Use narrower beam. 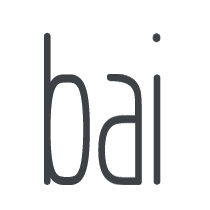 Used in scattered locales. Cannon bone beamer, Elk (also Deer, Mtn. Sheep). Extensive use away from Plains. Two edges created by hollowing out center. Wood and bone scraper. Bone shard implanted in wood with pitch binder. Common to Eastern Woodlands. Great tool. Split stick, Oak. Various hardwoods. Some use on NW Coast and scattered other locales. 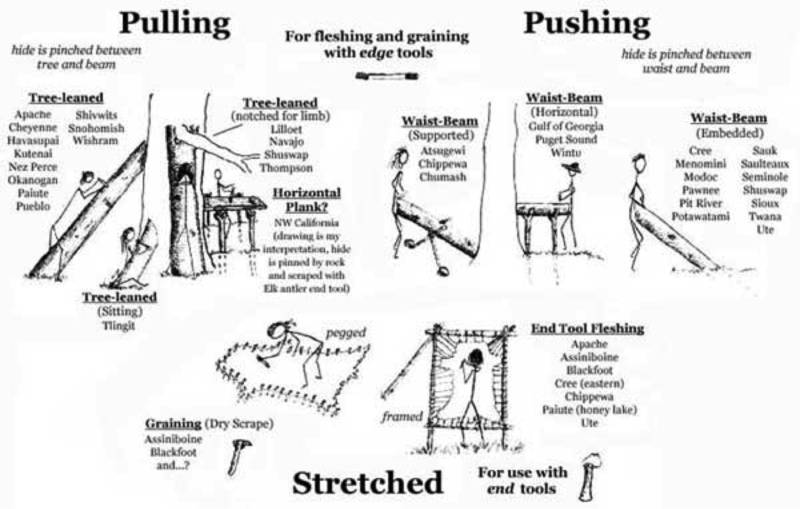 END SCRAPERS– some use for Deer, very common for furs and large hides. Left to Right: Hafted knapped stone for fleshing. Elbow adze, knapped stone on wood, for fleshing and dry-scraping.Cannon bone flesher, beveled edge, wrist thong brace. Most common of the end scrapers. Serrated cannon bone flesher, less common than previous, gained in popularity after contact. Elk antler, beveled edge, for graining wet-scrape on wooden plank (NW California only). Works, but is it worth the tine? You must know the status of your hide’s internal structure if you want to experiment with ways of improving brain penetration. 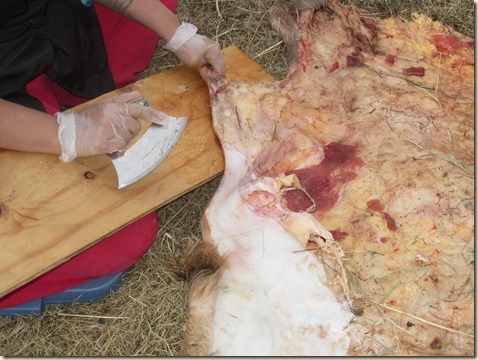 Use fresh , frozen or wet-salted hides, hides which have not significantly dried since the deer’s death. When hides dry they start to cure and an unknown factor comes into play: how much is cure affecting your results? As we work to simplify our techniques, hide-tanners often discuss how many brainings it takes to get a hide soft, but we have different definitions of the term. 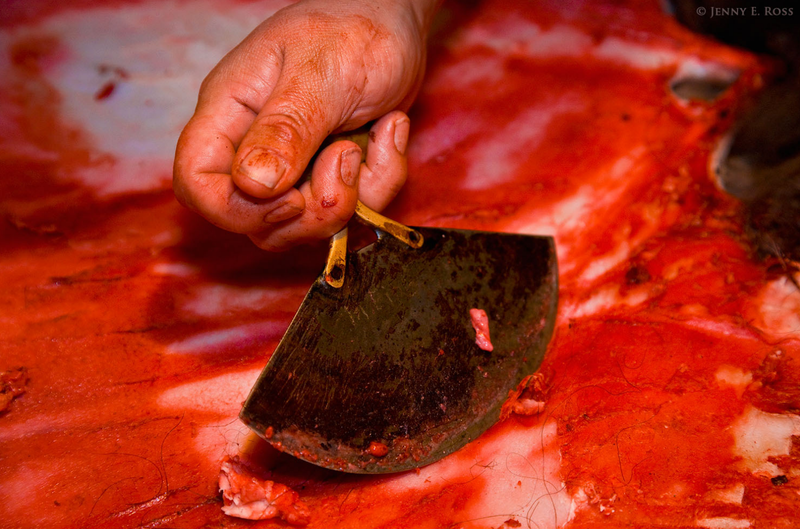 For some, it is how many times a hide was soaked in the brains, for others it is how many times a hide was worked until dry. Each time a hide is brought to the ‘ wrung out sponge’ moisture content and then put in the brain soup, brains penetrate deeper. Despite the fact that some techniques can result in consistently complete penetration in just one soak, you’re always better off braining more than once just to be sure. Brains contain emulsified oils, which permeate the water that they are mixed with, rather than seperating from it. This quality allows the tanner to coat the fibers with lubricating oils, without saturating every pour of the skin with oil. Nearly all tribes used brains, although there were a few notable exceptions. Tribes of the southern Colorado River region used saguaro cactus seeds. The Tonto Apache used jajoboa berries, a plant renowned for its emulsified oils. Sometimes, tribes in the southeast used sweetcorn. Peoples from the Gulf of Georgia used fish and sea mammal oils, with a somewhat different methodology. They would completely saturate the skin repeatedly with oils and then they’d degrease it with urine. This would chemically create a different type of leather, known as oil-tan. This is paralleled in modern days, by the tanneries that use cod oil to saturate the skin and then degrease it with sodium carbonate, resulting in what is popularly known as chamois. Other substances were put directly into the soak solution with the brains. Some of these, added oils; possibly to improve the feel of the finished skin, or at the least, to help the brains go farther. Other additives may have improved penetration by helping the brains slip past or break down the protective mucus. Oils: spinal fluid, liver, bone marrow, tallows and fats, fish oils, acorn soup, pine nuts. Buckskin is stretched from damp to dry to make it soft. Tools are used to aid in the stretching, as well as to abrade the surface of the grain and flesh sides. This abrasion of the outer surfaces, allows the skin to stretch fully, and the texture to be soft. 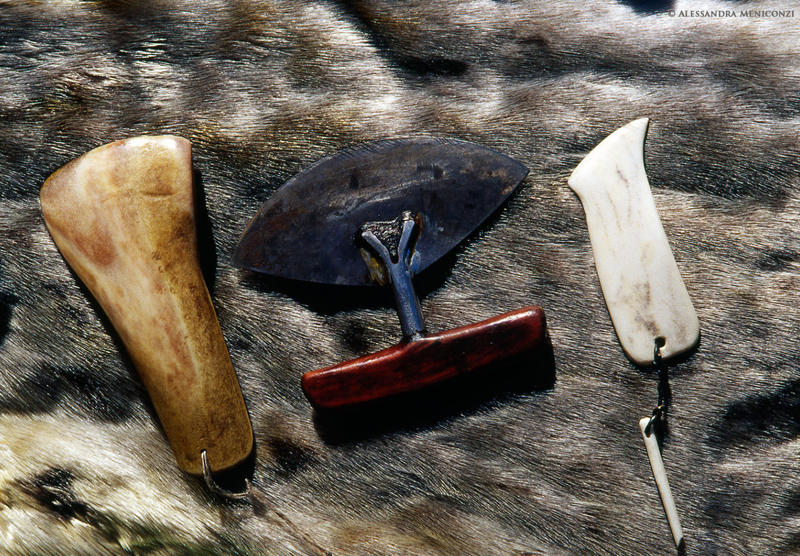 Abrading tools were used by all tribes. There were two types, rough surfaced and sharp edged. The sharp edged tools, because of their shape, also stretch the fibers, serving two functions. Some of these are the “thumb-nail scrapers” common to archaeological sites. Many people mistakenly assume these tools are dry-scrapers. Pumice, great for abrading without overly roughing up surface, extensive distribution. Mussel shells, abrades and stretches. Used as found, convenient thumb slot, and very effective. Common tool on west coast. Simple and retouched flint flakes, and slate shards. Many types of stone used including split river rocks (skipping stone types), extensive distribution. Stone and woodelbow adze, used with frame. Abrades and stretches. Used by buffalo hunting tribes. Hafted knapped stone, abrades and stretches. Plateau, Tlingit, Ojibwa, Natchez. 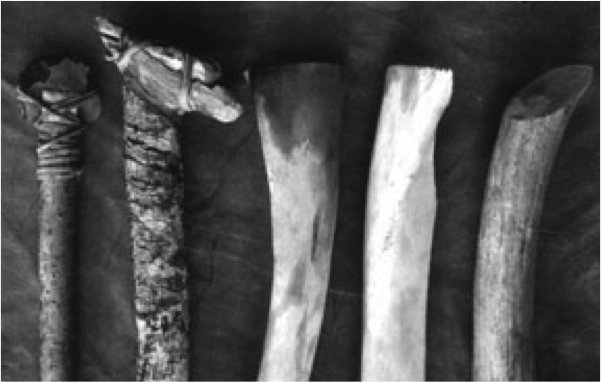 Buffalo humerus core, from bulbous end of bone. It is porous and very abrasive, after aging. Plains. Elk antler, beveled. Abrades and stretches. Plateau, NW California. Cannon bone, beveled. Abrades and stretches. California, Plateau, Apache. Deer antler, beveled. Abrades and stretches. Also, any thing abrasive or with an edge: turtle shells, sandstone, buffalo tongues! CABLES– left to right: Braided rawhide (buffalo sinew also used). Both mentioned mostly in connection with tanning Buffalo robes. Stretches hide well, a little abrasion, but not very durable (note wear in center). I might try a rawhide thong next time, for same effect, and no time braiding. Buffalo scapula, center of bone removed, working edge beveled sharp. Stretches and abrades, durable. Really shreds! Wild grape vine, lasts longer if used while still living. Some initial abrasion, good stretching. Also, any rough barked woody sapling, vine, or branch. Comanche, Potawatomi, northern California, eastern Great Basin. 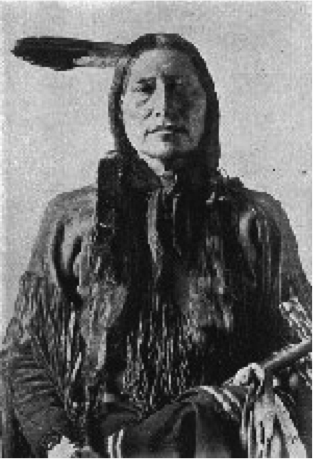 Deerskins were very frequently softened in frames (woodlands, plateau, NW Coast), hanging from horizontal poles (plateau, Apache), over beveled posts implanted in the ground, and with the hands and feet. The beveled post was common wherever the frame was not. There were many combinations of tools and softening techniques. Wooden post with stone implant. This stone has sharp, squared, top edges, so the post abrades as well as stretches. Couer D’Alene, southern California. Wooden post, hide stretched as its pulled over beveled top. Doesn’t really abrade. Very common tool. 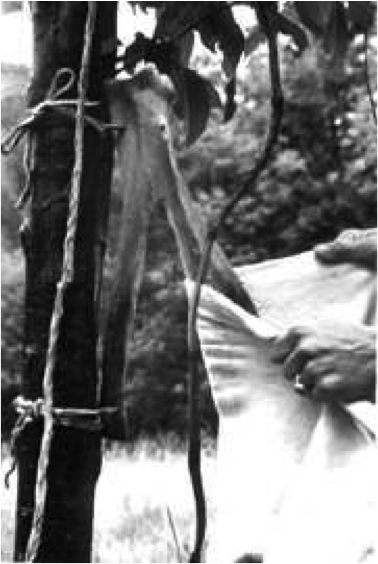 Suspended hide; hide suspended by buckskin thongs from pole supported by tripods. Allows for easy hand stretching and use of abrading and stretching tools. Plateau, Apache. Frame stretching; frame and hide lashed with rawhide. Allows you to stretch hide larger, thinner and flatter. Also reduces amount of stretch left in finished hide, which is good or bad depending on intended use. NW Coast, Plateau, northern Plains, Woodlands, Southeast. Knapped chert hafted to stick; long for two handed softening. Stretches and abrades. Common with frames. Beveled wood frame softening tool. Stretches, little abrasion. Spark, one of the explorer De Soto’s companions, describing the deerskin clothing of the Florida Indians. 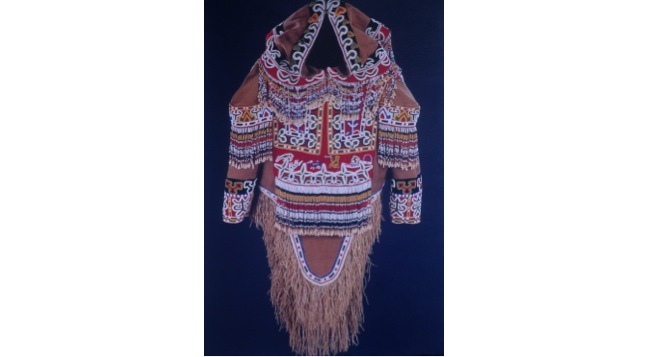 It is often stated that pre-contact Indians did not know of the use of tannins on hides. This is clearly not true. 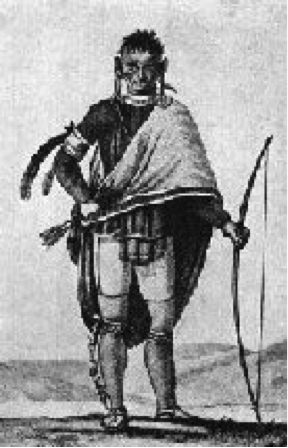 The very earliest reports, from nearly all sections of this continent, describe the natives coloring their deerskins with various bark dyes. They do not seem to have used them to create a full bark-tan, but even a short soak in tannins will change a hides nature to some degree. Tannins make skins less stretchy and a bit thicker, great for moccasins. They color skins. They may also make them slightly less water absorbant, long soaks do. I do not know how they effect their ability to go from wet to dry repeatedly. 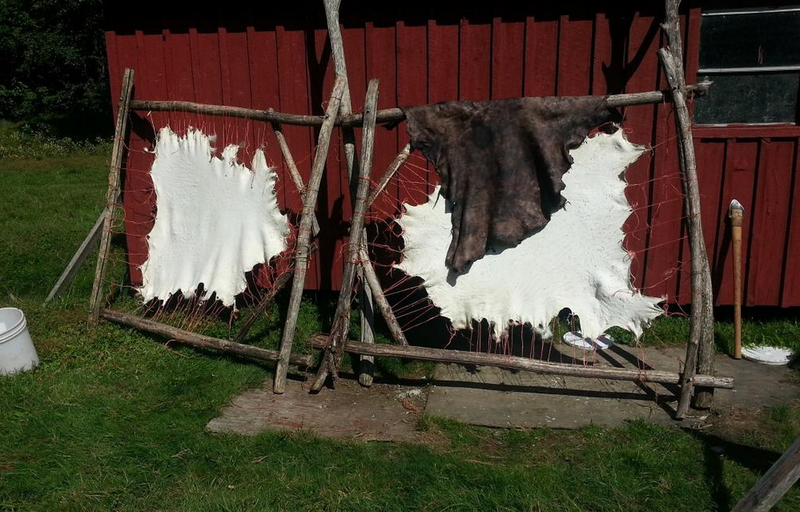 Dyes were specifically used on white unsmoked hides. The art, and range of color were highly developed in the southwest and the southeast. There use was as widespread as smoking, though not always as commonly used. In some areas, tanners clearly had a choice whether to dye, smoke or leave a hide white, depending on the intended use, and the preference of the tanner. Like smoking, dyeing was particularly mentioned in connection with moccasins. Tannin dyes used: alder, oak, paper birch, douglas fir, canaigre, ferns, sumach, hemlock, ironwood, willow, elm, elder, white maple, mtn. mahogany, indigo bush(dalea emorii), ephedra, lemonade berry (rhus trilobata), oregon grape, honey mesquite, leather root, mistletoe. Gansser, A. “The Early History of Tanning.” Ciba Review 81 (1950): 2938-2960. Hamilton, William L. “The Private Life of Club Chairs.” New York Times (22 January 1998): F1. Issenman, Betty Kobayashi. Sinews of Survival: The Living Legacy of Inuit Clothing.Vancouver: UBC Press, 1997. Kaufman, Leslie, and Craig S. Smith. “Chinese Pigs Feed a Western Fashion Boom.”New York Times (24 December 2000). ← What leather can do….